Did you guess good carbs vs bad carbs and good fat vs bad fat?!!! If yes, then you must be taking my classes at the Y ;). These two, carbs and fats, are so simultaneously linked with weight loss. I think it’s time we discuss how OK carbs and fats are for you! Yes, carbs and fats are GOOD FOR YOU, but first we need to learn which ones. Cutting back on the bad carbs can help you lose weight, as well as give you a feeling of more energy and less irritability. Carbs are the fuel that makes your body run. Putting the right fuel in your engine makes a world of difference. Because good carb foods tend to have higher fiber and lower calories than many processed bad carb foods, you’ll find yourself feeling fuller while eating fewer calories though it’s possible you’ll be eating a bigger volume of food. If you think about the kinds of foods you’re adding and the ones you’re giving up, this makes sense. It would take a lot more fruit to equal the same number of calories you’d eat in a candy bar, and you’ll probably feel satisfied after one piece or serving of fruit which is much lower in calories than the candy bar. Even better, you’ll feel satisfied for a long period of time and won’t feel the need for another unhealthy snack later in the day. But what exactly are GOOD carbs and BAD carbs….. Simple carbs are broken down quickly, giving your blood sugar a spike and sending you running back to the kitchen or snack machine within hours of your last fix. Complex carbs are the ones that give your body the best fuel. They are usually found in foods high in fiber, which break down more slowly, giving you a steady blood sugar level through the day and making you feel less hungry and irritable when mid-afternoon rolls around. Just because these foods have less desirable carbs does not mean you should kick them out of your life forever. A list of good carbs and bad carbs should not be seen as a strict rule. Yes, you should get most of your carbs each day from the “good” list, but you certainly don’t have to cut out alcohol or skip the birthday cake, as long as you don’t make it an every day or every meal thing. Now for some FAT chat! Saturated fats raise total blood cholesterol as well as LDL cholesterol (the bad cholesterol). 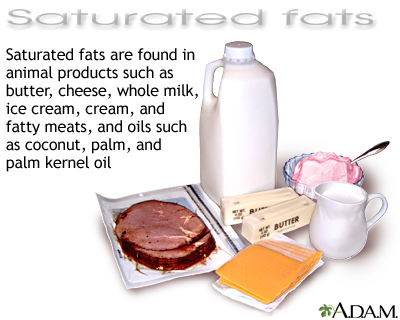 Saturated fats are mainly found in animal products such as meat, dairy, eggs and seafood. Some plant foods are also high in saturated fats such as coconut oil, palm oil and palm kernel oil. So now that you know the text book answers let’s hear from some REAL Tweeps that are knowledgable in the in’s and out’s of Carbs and Fats!!! Be sure to Follow these amazing people for the latest in health, fitness, and fun! I hope this post has been helpful!! April is Autism Awareness Month!! And it’s also The 9th Annual Imagine Walk and Family Fun Day for Autism!!! If you are interested in walking please let me know ASAP and if you can’t walk but can find it in your heart to donate even $1 please visit http://www.firstgiving.com/fundraiser/tera-norberg/9th-annual-imagine-walk-and-family-fun-day-for-aut and make your 100% secure TAX DEDUCTIBLE donation today!!! Proceeds benefit local school districts to allow educators to attend trainings to better serve kids on the Spectrum in the class room. With Zachary officially being a part of the Cranston, RI School District this means so much to our family. He is an extremely intelligent little boy who deserves the best education possible! Thank you in advance for supporting this cause XO. And to wrap things up I have to awesome sites for you to shop! The first is https://vanessa13.scentsy.us/Buy?partyId=31629015 and any purchases made will aid in Autism Awareness fundraising! Check out the Autism warmer for $35! Adorable!!!! So please shop shop shop for a great cause! And then of course click on any of the Amazing Grass Banners to the RIGHT!!! At check out enter coupon code HEALTHY123 and receive a nice little savings ;)! I think sugar should be called out specifically as a simple carb, not because it’s so horribly bad for us, but because it’s in EVERYTHING and we don’t even realize it. The other thing I notice is that everyone is reluctant to say you should cut out alcohol. Alcohol does absolutely nothing good for your body. Perhaps there are a few benefits from the grapes in wine, but you could get those same benefits from juice and avoid the alcohol. I realize that people like to drink, but people like to eat cheesecake too, and you won’t hear anyone say it’s all right to have just a slice or two of cheesecake with your dinner every night. Alcohol is sugar that your body cannot process = BAD.